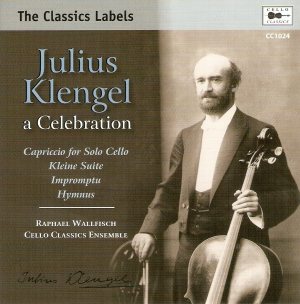 Julius Klengel (1859-1933) was one of the most important figures in the history of the cello. He studied composition in his native Leipzig with Salomon Jadassohn (who taught Grieg and Delius) and whose own music has been recorded, very successfully, of late. Klengel made his debut at 17 whilst a member of the Leipzig Gewandhaus, whose ranks he had joined two years earlier. His pupils at the Leipzig Conservatoire included some of the most prominent players of the twentieth century: Feuermann, Suggia, Piatigorsky, Edmund Kurtz, Paul Grümmer and William Pleeth amongst them. He composed quite widely, and was the recipient of many dedications and gave many premieres. Reger was a particularly good colleague but he was a good friend of Brahms, as well as Taneyev amongst many others. This celebratory disc intersperses some of Klengel’s own 78 discs between original compositions and adds up to a fine portrait. His Capriccio was written in 1905 and dedicated to his most flamboyant student, Guilhermina Suggia. It makes appropriately strong demands whilst basing itself strongly on the introduction of Schumann’s Op.121 Violin Sonata. There then follow some testing variations, and serious investigations of every aspect of left and right hand technique. No wonder it used to be a competition favourite. Three Pieces for two cellos and organ was published in 1931. There’s a definite sense of poignancy as the two cellos entwine supported by the organ - and a strong element of spiritual sensitivity too, as well as quiet charm. The Little Suite is in five movements, Klengel ensuring the three cellist’s parts are cleverly distributed and not tangled up. There’s a coquettish Gavotte, a Borodin or maybe even Taneyev-like Largo and a confident Fughette to end. He goes one better in the Impromptu for four cellos, which opens as a hymnal affair but then bursts into the Wedding March most unexpectedly and most amusingly. The final piece is the poignant Hymnus, for twelve cellos, dedicated to the memory of the conductor Artur Nikisch at whose funeral it was played in 1922. It exemplifies his gift for beautiful part writing and rich romanticism. Klengel’s own playing can be heard in four works - his portamenti are pervasive, often promoting pathos (as in the Tartini Adagio), rhythm solid, technique powerful (try the tricksy Crossmann Taranetlla) and reasonable tone. I wish the examples had been dated with full discographic details however. The Bach Sarabande is a fine performance and I know was recorded in 1927. Raphael Wallfisch takes on the finger and wrist crunching challenges of the Capriccio on a theme of Schumann. His cellistic and other colleagues named in the head note and those in the twelve-strong Cello Classics Ensemble perform admirably and have been well recorded. The booklet is attractive. Maybe it’s time for some large-scale Klengel works to be recorded. How about his Double Concerto for starters?